Big trouble struck a corner of the “alt-right” last week when long simmering personal tensions boiled over into an all out feud. Kyle “Based Stickman” Chapman, had it out with fellow California far-right activists Johnny Benitez (real name Juan Cadavid) and Irma Hinojosa, trading blows first in person and later online. Then long shot Florida GOP senate candidate Augustus Invictus jumped into the fray to badmouth Chapman, a former ally. Just a few months ago they were all friendly enough, sharing the stage in early August for an event clumsily titled “Make Men Great Again.” But the bromance didn’t last. Their social media feeds were frenzied last week as they accused each other of eye-gouging, dealing drugs, worshiping Lucifer, and running spy operations for the Left or the FBI. With friends like these, who needs antifa? Storm clouds first began to churn a few weeks after the August event. Benitez was forced to step down from the Fraternal Order of Alt-Knights (FOAK), an offshoot of Gavin McInnes’ Proud Boys led by Chapman. According to a post from McInnes, it was because he tried to change the rules and got “way too into” the club. Chapman would later tell the Los Angeles Times that Benitez was kicked out for being a “racist white nationalist,” a charge Benitez denies. In September, screenshots circulated on social media suggesting that Chapman had given his “greenlight” on Benitez. Benitez and Hinojosa — his girlfriend — interpreted this as a threat of violence, and Hinojosa took to Twitter to denounce Chapman. Last week’s theatrics began in earnest October 22 at the California GOP convention, when Chapman and Benitez got into a physical altercation. Chapman claims Benitez threw the first punch, and Benitez swears that Chapman tried to gouge out his eyes. The conflict escalated two days after the fight when Chapman brought a group of Proud Boys to crash an event hosted by Hinojosa in Laguna Beach. The showdown primarily involved trading insults and shining flashlights in each other’s faces. The drama continued on social media, as accusations of cuckoldry and wrongdoing flew on Twitter. Benitez even tagged the FBI in a reply to a since-deleted tweet Chapman posted that referenced drugs. No soap opera is complete without an unexpected visitor — a long-lost sibling, a love child, or a rival previously thought dead — and in this drama, Augustus Invictus stepped in from off stage, and denounced Chapman, a former close ally. Earlier this year, Invictus cozied up to Chapman to assist in the founding of FOAK, and positioned himself as second-in-command under him. But he did an about-face this week, accusing Chapman of urging far-right YouTuber Brittany Pettibone to remove a video of an interview with Invictus, who posted a lengthy livestream to Facebook bemoaning this slight, and with a melodramatic flourish, resigning from the Alt-Knights. Just a few hours later, Chapman posted a response denying the accusation. Like the most boring possible retelling of Rashomon they wove conflicting tales of persecution and sacrifice. Invictus cast himself as the helpless victim of a “blacklisting” campaign and threw barbs at Chapman, who he said gets coked up, takes pills, and uses rallies to pick up women (the Southern Poverty Law Center has obtained screenshots of Invictus himself soliciting drugs and women from an acquaintance, proving that projection is not just for the theater). In his response, Chapman mocked “the fake colonial accent [Invictus] tries to put on,” and called him a has-been and a Satan-worshipper. Fans of all these far-right personalities also jumped in and took sides. 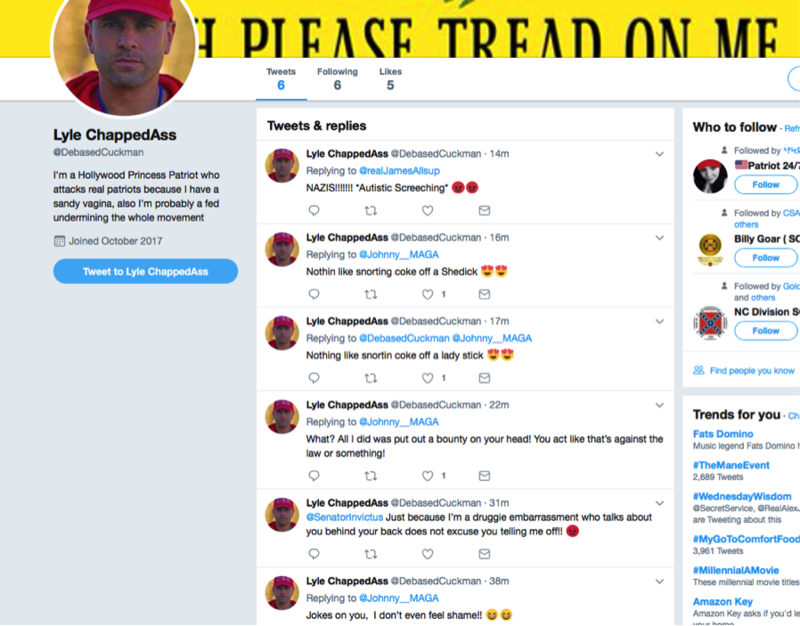 One enterprising troll from the anti-Chapman camp created a fake Twitter account for Chapman with the name “Lyle ChappedAss” and the handle @DebasedCuckman. Personal conflicts like these have hobbled a movement that likes to claim to be united. But their loathing of “SJWs,” “commies” and “cuckservatives,” it seems, can’t outstrip their loathing for each other. Photo credit: Jeremy Breningstall/ZUMA Wire/Alamy Live News and Twitter.